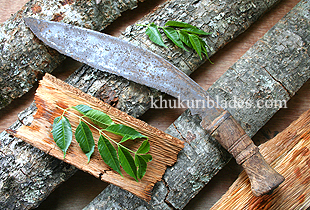 Antique Kukri are kukris that are more than 50 years old. Some are army kind that were used and carried by the soldiers for many years while in service and some are village kind that were used by locals and farmers all over Nepal as a tool and as a weapon using them on multiple task from chopping trees, firewoods, building houses to many domestic work like in the kitchen while cooking. They have been literally used, abused and bruised and put to rest for good thinking it had done enough. They are rusted, beaten up and worn out. Handles too are broken, worn out, cracked and eaten up by insects. The leather scabbards are lost, misplaced and vanished as leather does not last that long when not taken care. These kukris are unique, different to another, one of a kind because of its wear and tear depending how ones handles them thus making one the only piece in entire Nepal that can not be duplicated. Here are some examples. This bhojpure kukri is 74 years old. It belonged to a farmer whose father had it made in 1933 using railway track brought from India. This kukri has been used for everything.